Use Tableau Prep to combine, shape, and clean your data for analysis in Tableau. Drag and drop or double-click to bring your tables into the flow pane, and then use familiar operations such as filter, split, rename, pivot, join, and union to clean and shape your data. Each step in the process is represented visually in a flow chart that you create and control. 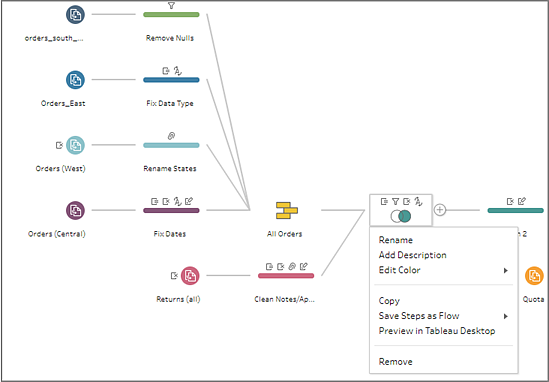 Tableau Prep tracks each operation so that you can check your work and make changes at any point in the flow. The result of combining data using a join is a table that’s typically extended horizontally by adding fields of data. Union is a method for combining data by appending rows of one table onto another table. ……Make sure the tables you union have the same number of fields, the same field names, and the fields are the same data type.